2 Inch Mini-Monitor - SOS Safety International Inc. Designed for use in corrosive atmospheres that require the dependability and durability of an all brass monitor, the Mini monitor is suitable for most industrial environments. It is compact – under 9” (229 mm) wide and requiring only 16” (406 mm) clearance, perfect to operate in a tight space. Designed for use in corrosive atmospheres that require the dependability and durability of an all brass monitor, the Mini monitor is suitable for most industrial environments. 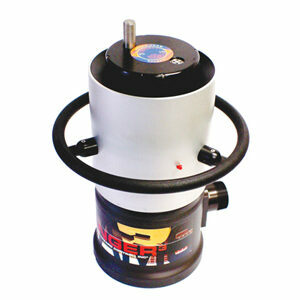 It is compact – under 9” (229 mm) wide and requiring only 16” (406 mm) clearance, perfect to operate in a tight space. 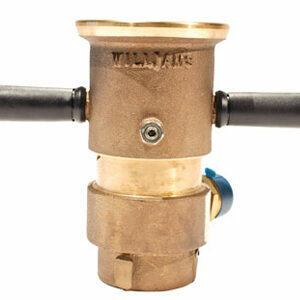 It has a 2” waterway efficiently designed to minimize pressure drop. 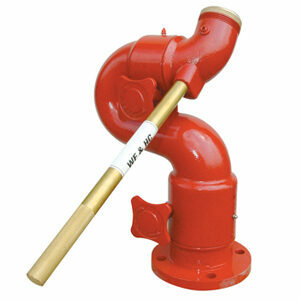 It flows up to 300 gpm @ 100 psi (1,136 Lpm @ 6.9 bars) and maximum 500 gpm @ 200 psi (1,893 Lpm @ 13.8 bars). 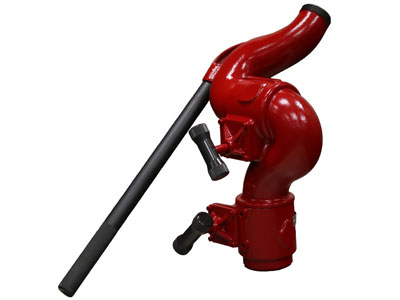 It weighs about 48 lbs (21.8 Kg) and features a 2” NPT female inlet base, 1.5” NH male discharge tip and a tiller bar control handle with rubber grip for vertical (from -45° to +90°) and horizontal (360º) adjustments with positive quarter-turn locking handles. The monitor is supplied with natural brass finish. A lightweight aluminium version (about 16 lbs or 7.3 Kg) with red urethane enamel finish is also available.